SHAON84 launches a new subsidiary portal, ‘Uncodist’, an unique name in Google Search. 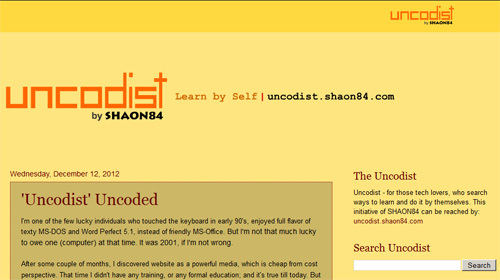 Hosted in Google’s Blogger, Uncodist is the second blog after SHAON84 Official Blog (current one). More blogs are on the way to come, hopefully launched by this December 2012. However, Uncodist is a website, rather just been called as a Blog. Uncodist mainly will publish technology related ‘Know-how’ articles. The major difference comparing to other regular tech blog will be, it’s more friendly, well formed and well informative enriched with relevant material. The first article of the site describes the background and other matters. Uncodist is under the PenNPaper, a major section of SHAON84. This entry was posted in SHAON84. Bookmark the permalink.